Love Actually isn’t a new movie, by any means. It was released in 2003 and many people will probably see it at least once. 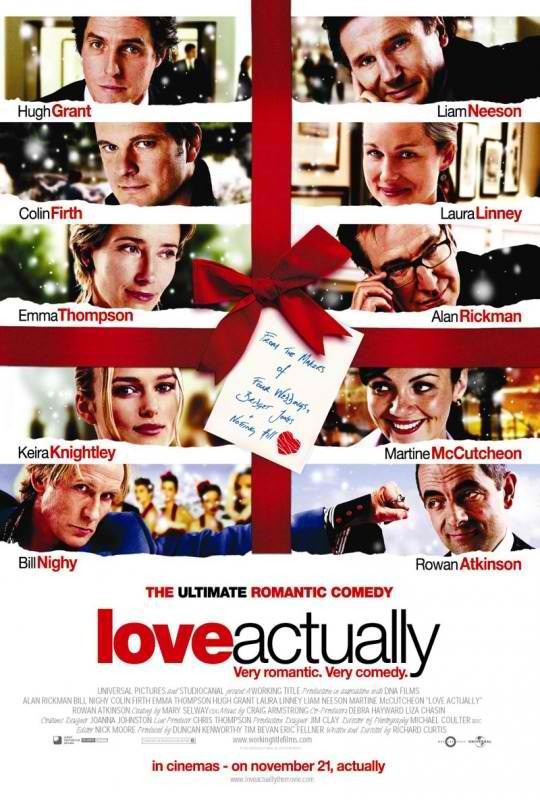 If you’re looking for a great romantic drama to watch over the holiday season, Love Actually is the perfect choice. Without giving any spoilers, the basis of the film is this: mostly set in London during the weeks leading up to Christmas, the story follows a bunch of characters who don’t seem to have much to do with each other at first glance. As the story winds along, you realize most of them have, at the very least, something superficial in common. The movie is all about love. Love is all around us, actually. The film shows us all kinds of love – failed love, familial love, and romantic love. There’s betrayal, romance, and even the sweet stirrings of young love. Overall, the film is a fun glance at the various types of love. The fantastic acting from all of the characters (Billy Mack is probably my favorite character) make this movie great, and one I’d recommend to anyone interested in watching this type of flick in front of a crackling fire.